I sat down to choose photos for tonight’s newsletter. Lo and beyond, I had filled my phone with photos of experimental basil. Why didn’t I take pictures of our photogenic crops and crew?? There are some weeding photos, but the crew nixed them as too unglamorous. My ‘side job’ of tracking crop diseases is important farm work and gives me a welcome break from our focus on harvests and deliveries. In our small basil trial, I planted breeding lines from Bejo, the European seed company that developed the disease-resistant Eleonora variety that we grow in summer plantings. I approached Bejo and offered to test their newest lines and breeding materials. Bejo is selecting for resistance to downy mildew, a disease that ruined our summer basil plantings a few years ago. We have a better handle on that problem now, with Eleonora a useful part of the solution. I am very interested to see their newest breeding. I have to say that some of the experimental lines taste terrible … as in “spit-them-out-on-the-ground” terrible. However, the real test is how they react to downy mildew. It hasn’t shown up yet but spores blow into the state each year, so we will see it eventually. Experimental basil lines with carrots (and weeds) on either side. We are still transplanting seedlings because we need to feed you into the fall. Our weekly Monday to Thursday harvest schedule means we usually transplant on Fridays. However, it’s rained the last four Thursday nights, ruling out Friday transplanting. The crew worked late this Tuesday to rush in a planting. Broccoli, napa cabbage, kohlrabi and the final basil are all tucked in the ground. Good thing, because it rained again Tuesday night and probably will again tonight. We still have one final transplanting to go, a small field of quick-growing, cold-hardy Asian greens. Then we can grease the transplanter and pack it up for the winter. We feel lucky that we didn’t get much rain this spring, even though we grumbled about the extra irrigation work. Spring was rainy in much of Wisconsin, conditions that can jump-start disease problems for the rest of the year. Weather-related problems are popping up in some of our crops but could be much, much worse. However, we are having trouble staying ahead of the weeds because of the rain. Steve is beginning to despair about it. He cultivates the weeds but they simply re-root with the next rain. Check out Jackie’s boots after sweet corn harvest today. They got sucked off her feet in the mud. That tells you what our bottom fields look like. Some sites get an heirloom tomato. Some sites get globe eggplant. Next week’s box will probably contain tomatoes, peppers, melon, edamame soybeans, cucumbers and more. Sweet corn – Looks like some of the corn will need trimming again this week. We harvested two separate plantings. One has bugs at the tip, one doesn’t. Collard greens – First harvest from a fresh planting, these are quite nice. Oranos peppers (orange, tapered, sweet) – These sweet orange peppers look like frying peppers but behave like bell peppers during cooking. We love them as a snack or lunchbox pepper – a perfect little package. Flavor is excellent, yummy. Really, can you tell that I like these peppers? If you find a single tomato in your box (not in the paper bag), then it’s an heirloom tomato. We tuck those near the top of the box where they won’t get damaged. Heirloom tomatoes are unusually flavorful and unusually fragile. Some are ripe and ready to eat. Some need a day or two to ripen. Place on your kitchen counter so you can keep an eye on it, and eat it as soon as it’s ripe. These bruise very easily so handle gently. Basil – Some sites get Eleonora Italian basil this week, some sites get Thai basil. 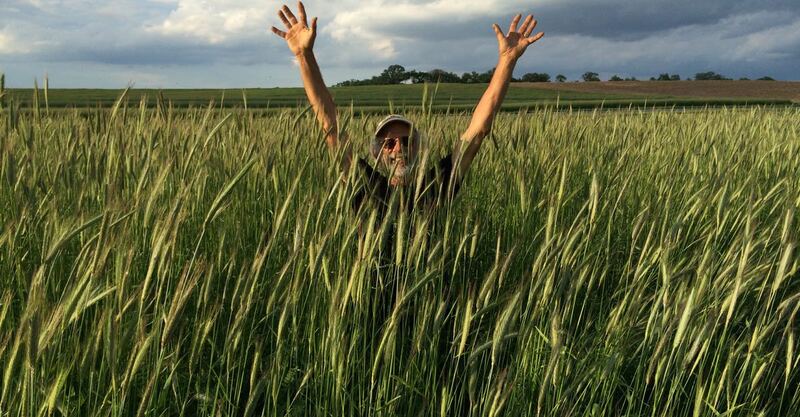 Garlic – This week’s garlic is from our friend John Hendrickson of Stone Circle Farm. In a small bowl, whisk buttermilk, yogurt, lemon juice, garlic, onion, basil and olive oil together until totally smooth (I often do this in a mason jar and then just shake vigorously: I feel like the garlic and onions get better distributed this way). Season with salt and pepper. Set aside while you prepare the rest of the salad. This will help mellow the raw garlic and onion. Cook beans in a large pot of boiling salted water for 3 minutes. Drain and rinse with cold water. They should be just barely cooked. Melt butter in a large pan or skillet (I used a well-seasoned 12-inch cast iron skillet) over medium heat. Once melted, add peppers, onion, salt and pepper, and saute until soft, about 10-15 minutes over medium low heat. A little bit of char or black is okay! Add corn, tomatoes and basil to pan and saute 5 minutes longer until ingredients are well-mixed and tomatoes are soft. If you feel there is too much liquid in the pan, feel free to drain a bit (I drained about 1/4 cup of tomato juice). In a large bowl, combine eggs and milk and whisk until smooth. Add feta to skillet distributing it evenly around the pan and immediately pour egg mixture over veggies and feta. Use a fork to ensure things are distributed evenly with the egg mixture and cook over medium heat for 10 minutes (or until the edges begin to set). Once the edges of the frittata have set, throw in the oven for 10 minutes until the center is firm and no longer wiggles. Serve warm.